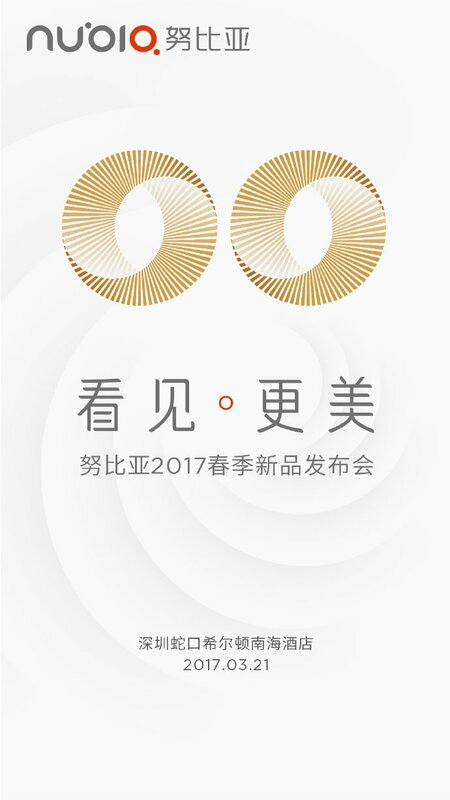 ZTE's Nubia division today released a new teaser on their weibo account that confirms a dual camera setup for this upcoming unknown Nubia smartphone that will be launched in the company March 21st event at Shekou, China. We have seen many smartphone companies using the dual camera setups on their smartphones but it will be the first Nubia smartphone to feature a dual camera setup as the company haven't yet launched any dual camera smartphone as of now. The teaser released by the company comes with two golden circles confirming the dual camera setup for this device followed by the release date March 21, 2017. There are no rumors available about this device so we have to wait for them or at least we have to wait for the TENAA listing of the device to have more details of this mystery Nubia device. Accoding to a weibo user, the new Nubia device might feature a borderless display and might be powered by the Snapdragon 835 processor. If the company launches it with the SD835, it will be the second phone to be powered by the SD835 SoC after Xperia XZ Premium smartphone that was launched at the MWC 2017 event last month. The weibo user however, hasn't shared any more details about this device in his post. The ZTE's owned company, Nubia, launched their new phone at MWC last month with name Nubia N1 Lite that comes with a single camera setup. It features a 5.5-inch HD IPS display with 1280 x 720 pixels resolution and is powered by a quad-core MediaTek 64-bit processor with 2GB of RAM with 16GB internal storage capacity along with MicroSD card expandable storage capacity. It runs on the Android 6.0 (Marshmallow) OS out of the box and supports Dual SIMs. It features an 8-megapixel rear camera with dual LED flash and f/2.0 aperture along with a 5-megapixel front-facing camera with LED flash. It is powered by a 3000mAh battery and connectivity options includes 4G LTE, WiFi 802.11 b/g/n, Bluetooth 4.0, GPS, 3.5mm audio jack and FM radio support as well. A fingerprint scanner is available on the rear side.